Born in Portville, NY Charity earned her Bachelor’s Degree in Music Education from James Madison University. She was accepted into the United States Navy in 1997 as a professional musician and has since served the last 20 years in Navy Bands around the country. While stationed in Jacksonville, FL, yoga became her saving grace which took her from a place of brokenness and just managing life to a place of self-acceptance and learning how to joyfully live life! Charity graduated her 200 RYT at MBody Yoga with teachers Mark White, Dawn Clapp and Frank Markowski in early 2016 and has not stopped sharing the beauty of yoga since! She began teaching at MBody Yoga in Jacksonville after completing training, was a guest teacher at Jacksonville’s “Yoga Fest” in 2016 and participated in a “Momaste” workshop with mom’s-to-be” who were looking to continue their yoga journey while pregnant. Charity and her family moved to Chesapeake in September 2016. 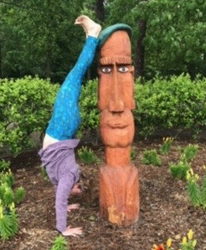 She currently leads practices at J-Fit, Sentara Heart Hospital, Suffolk Townebank, and for her Sailors once a week and has taught a yoga wellness clinic incorporating chair yoga. She is married to an amazing man, Shane, and the mother of two incredible children, Carl (17) and Emily (10) who love yoga too! “I absolutely love learning from and with my students. Connecting with each and every human in a safe space where being who you are is celebrated is a joy and is why I teach. I believe through yoga we learn to give ourselves and others permission to stop, breathe, and live in the moment. It is ok to make mistakes, look the way you look, and be perfectly imperfect! Perfection should not be the goal; being ourselves should be”.